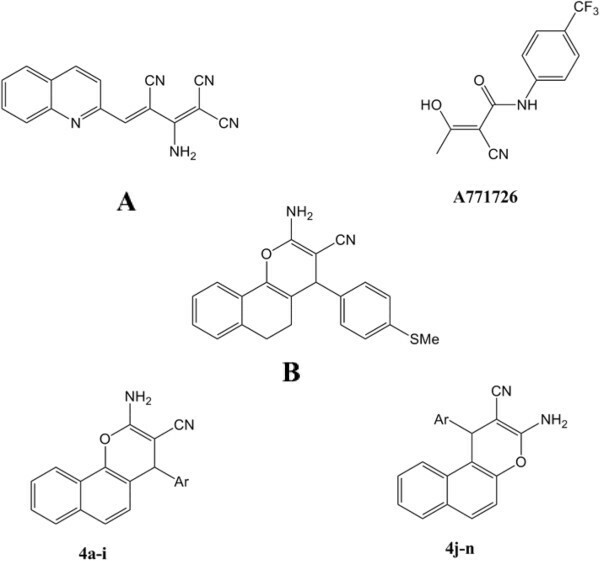 A series of 2-amino-4-aryl-4H-benzo[h or f]chromene-3-carbonitrile derivatives were synthesized and evaluated for inhibition of Src kinase and cell proliferation in breast carcinoma (BT-20) cell lines. The one-pot, three-component reaction of α or β-naphthol, malonitrile and an aromatic aldehyde in the presence of diammonium hydrogen phosphate was afforded the corresponding 2-amino-4-aryl-4H-benzo[h or f]chromene-3-carbonitrile derivatives, All target compounds were evaluated for inhibition of Src kinase and cell proliferation in breast carcinoma (BT-20) cell lines. Among all tested compounds, unsubstituted 4-phenyl analog 4a showed Src kinas inhibitory effect with IC50 value of 28.1 μM and was the most potent compound in this series. In general, the compounds were moderately active against BT-20. 3-Nitro-phenyl 4e and 3-pyridinyl 4h derivatives inhibited the cell proliferation of BT-20 cells by 33% and 31.5%, respectively, and found to be more potent compared to doxorubicin (25% inhibition of cell growth). The data indicate that 4-aryl-4H-naphthopyrans scaffold has the potential to be optimized further for designing more potent Src kinase inhibitors and/or anticancer lead compounds. c-Src kinase is one of the most widely studied member of the Src (acronym of sarcoma) family of non-receptor protein tyrosine kinases (PTKs). c-Src acts as a critical component in a number of signaling pathways that control cell growth, proliferation, invasion, and apoptosis [1–3]. Previous studies have shown that c-Src kinase is highly regulated and is active only at low levels in most normal cells while it is upregulated in many human cancers [4, 5]. Most recently emerging data reveals that the predominant consequences of increased c-Src activity in tumor cells results in reduction of cell adhesion, facilitation of motility, and thereby promotion of an invasive phenotype . Interest in designing c-Src kinase inhibitors as a treatment for cancer and in particular, as an antiinvasion strategy has been increased in the last decade. The current popularity of Src kinases as drug targets is due to several factors including the positive correlation between the development of cancer and the upregulation of Src activity and reduction of cancer progression by inhibition of Src kinase in several types of cancer [7–10]. Several c-Src kinase inhibitors have been identified over the years . 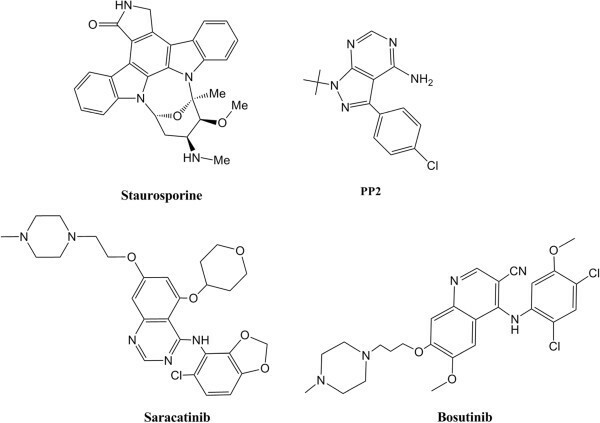 Src kinase inhibitor scaffolds span a variety of structural classes, including staurosporine as a standard nonselective protein kinase inhibitor, pyrazolopyrimidine (e.g., PP1, PP2) [12, 13], anilinoquinazoline [14, 15], and quinolinecarbonitrile [16–18] derivatives. The Saracatinib (AZD0530) [15, 19] and Bosutinib (SKI-606) [20, 21] with anilinoquinazoline and 3-quinolinecarbonitrile cores, respectively (Figure 1), are among potent Src kinase inhibitors, which are currently in clinical development for the treatment of a wide range of tumor types. Since ATP binding region is strongly conserved among protein kinases, designing selective Src kinase inhibitors is still a great challenge. Therefore, research is needed to explore new scaffolds which selectively inhibit Src kinase domain. Chemical structures of some of the Src kinase inhibitors. Recently emerging data support the hypothesis that the presence of a nitrile group in different scaffolds, such as quinolinecarbonitrile (e.g., Bosutinib), and benzylidene-malononitriles (tyrophostins (acronym of tyr osine phos phorylation in hibitors)), is crucial for protein kinase inhibitory activity . Compound A (Figure 2)  with 2-quinoline tyrophostin structure exhibit IC50 in the low molecular range (IC50= 1.7 μM) against EFGR. Furthermore, A771726 (Figure 2) with cyano hydroxyl β-butenamide, which is the predominant active metabolite of Leflunamide, has been identified as a tyrosine kinase inhibitor and antiproliferative agent [24, 25]. This compound was used as a starting lead for designing new antiproliferative compounds that finally led to the identification of 4-aryl-4H-5,6-dihydronaphtho[1,2-b]pyran B (Figure 2) as a new lead compound with moderate activity on the mesenchymal stem cell proliferation assay (IC50 = 13 μM) . Different derivatives of naphthopyranes have been synthesized since then and showed multiple pharmacological effects, such as anti-rheumatoid, anti-diabetic, anti-proliferative, and protease inhibition effects [25, 26]. Benzylidene-malononitrile(tyrophstin) derivative as protein kinase inhibitor (A), Chemical structures of A771726, active metabolite of Leflunomide, antiproliferative 4-aryl-4 H -5,6-dihydronaphtho[1,2-b]pyran (compound B), and synthesized 4-Aryl-4 H -Naphthopyrans (4a-n). We previously reported synthesis and evaluation of 4-aryl-4H-chromene-3-carbonitrile derivatives as Src kinase inhibitors . As part of our efforts to identify new scaffolds as Src kinase inhibitors [28–35], herein we report the synthesis and evaluation of selected 2 or 3-amino-4-aryl-4H-benzo[h or f]chromene-3-carbonitrile derivatives 4a-n (Figure 2) that contains both nitrile and naphthopyrane cores as Src kinase inhibitors or anti-proliferative agents. All starting materials, reagents, and solvents were purchased from Merck AG (Germany). The purity of the synthesized compounds was confirmed by thin layer chromatography (TLC) using various solvents of different polarities. Merck silica gel 60 F254 plates were applied for analytical TLC. Column chromatography was performed on Merck silica gel (70–230 mesh) for purification of the intermediate and final compounds. Melting points were determined on a Kofler hot stage apparatus (Vienna, Austria) and are uncorrected. 1H NMR spectra were recorded using a Bruker 500 MHz spectrometer (Bruker, Rheinstatten, Germany), and chemical shifts were expressed as δ (ppm) with tetramethylsilane (TMS) as an internal standard. The IR spectra were obtained on a Shimadzu 470 (Shimadzu, Tokyo, Japan) spectrophotometer (potassium bromide disks). The mass spectra were run on a Finnigan TSQ-70 spectrometer (Thermo Finnigan, West Chester, OH, USA) at 70 eV. Elemental analyses were carried out on a CHN-O-rapid elemental analyzer (Heraeus GmbH, Hanau, Germany) for C, H, and N, and the results were within ± 0.4% of the theoretical values. In general, diammonium hydrogen phosphate (DAHR, 0.5 mmol) was added to a mixture of α or β-naphtol (5 mmol), substituted aryl-aldehyde (5 mmol), and malonitrile (5 mmol) in ethanol (10 mL) and water (10 mL). The reaction mixture was stirred at room temperature for 4 h. After cooling, the precipitated solid was filtered, washed with cold ethanol, and crystallized from the same solvent. The synthesized compounds were characterized by IR, 1H NMR, mass spectrpscopy and elemental analysis. Physicochemical and spectral properties of compounds 4a-n were consistent with the previously reported data [36, 37]. The effect of synthesized compounds on the activity of c-Src kinase was determined by HTScan Src Kinase Assay Kit, catalogue number 7776 from Cell Signaling Technology (Danvers, MA, USA); according to manufacturer’s protocol. Streptavidin-coated plates were purchased from Pierce (Rockford, IL, USA). In brief, the kinase reaction was started with the incubation of the 12.5 μL of the reaction cocktail (0.5 ng/μL of GST-Src kinase in 1.25 mM DTT) with 12.5 μL of prediluted compounds (dissolved in 1% DMSO) for 5 min at room temperature. ATP/substrate (25 μL, 20 μM/1.5 uM) cocktail was added to the mixture. The biotinylated substrate (catalogue number 1366) contains the residues surrounding tyrosine 160 (Tyr160) of signal transduction protein and has a sequence of EGIYDVP. The reaction mixture was incubated for 30 min at room temperature. The kinase reaction was stopped with the addition of 50 μL of 50 mM EDTA (pH 8.0). The reaction solution (25 μL) was transferred into 96-well streptavidin plates (Pierce, part number 15125), diluted with 75 μL double distilled water, and incubated at room temperature for 60 min. At the end of the incubation, the wells were washed three times with 200 μL of 0.05% Tween-20 in PBS buffer (PBS/T). After that to each well was added 100 μL of phosphotyrosine antibody (P-Tyr-100) (1:1000 dilution in PBS/T with 1% BSA) and the wells were incubated for another 60 min. After washing three times with 0.05% Tween-20 in PBS/T, the wells were incubated with 100 μL secondary anti-mouse IgG antibody, which was HRP-conjugated (1:500 dilution in PBS/T with 1% BSA) for next 30 min at room temperature. The wells were washed five times with 0.05% Tween-20 in PBS and then were incubated with 100 μL of 3,3',5,5'-tetramethylbenzidine dihydrochloride (TMB) substrate for 5 min. The reaction was stopped by adding 100 μL/well of stop solution to each well and mixed well and read the absorbance at 450 nm using a microplate reader (Molecular devices, spectra Max M2). IC50 values of the compounds were calculated using ORIGIN 6.0 (origin lab) software. IC50 is the concentration of the compound that inhibited enzyme activity by 50%. All the experiments were carried out in triplicate . Breast carcinoma BT-20 (ATCC no. HTB-19) cell lines were obtained from American Type Culture Collection. Cells were grown on 75 cm2 cell culture with EMEM medium for breast carcinoma and supplemented with 10% fetal bovine serum (FBS), and 1% penicillin-streptomycin solution (10,000 units of penicillin and 10 mg of streptomycin in 0.9% NaCl) in a humidified atmosphere of 5% CO2, 95% air at 37°C. Cell proliferation assay of compounds was evaluated in BT-20 cells, and was compared with that of doxorubicin (DOX). Cell proliferation assay was carried out using CellTiter 96 aqueous one solution cell proliferation assay kit (Promega, USA). Briefly, upon reaching about 75-80% confluence, 5000 cells/well were plated in 96-well microplate in 100 μL media. After seeding for 72 h, the cells were treated with 50 μM compound in triplicate. DOX (10 μM) was used as the positive control. Incubation was carried out at 37°C in an incubator supplied with 5% CO2 for 72 h. At the end of the sample exposure period (72 h), 20 μL CellTiter 96 aqueous solution was added. The plate was returned to the incubator for 1 h in a humidified atmosphere at 37°C. The absorbance of the formazan product was measured at 490 nm using microplate reader. The blank control was recorded by measuring the absorbance at 490 nm with wells containing medium mixed with CellTiter 96 aqueous solution but no cells. Results were expressed as the percentage of the control (DMSO without compound set at 100%). The percentage of cell survival was calculated as (OD value of cells treated with test compound - OD value of culture medium) / (OD value of control cells – OD value of culture medium) × 100%. Naphthopyran analogs described here (4a-n) were synthesized following the synthetic routes outlined in Figure 3. 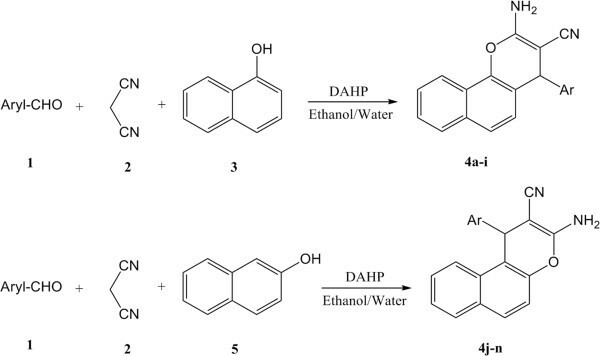 The compounds were synthesized according to the previously reported general procedure by a one-pot reaction  through the condensation of a substituted aromatic aldehyde (1), malonitrile, and α or β-naphtol (3, 5) in ethanol and water in the presence of diammonium hydrogen phosphate (Figure 4). Inhibition of BT-20 cell proliferation by compounds 4a-n (50 μM) after 72 h incubation. The results are shown as the percentage of the control DMSO that has no compound (set at 100%). All the experiments were performed in triplicate. One-pot synthesis of 4-Aryl-4 H -Naphthopyrans 4a-n. The results of Src kinase inhibitory activity of compounds 4a-n are shown in Table 1. 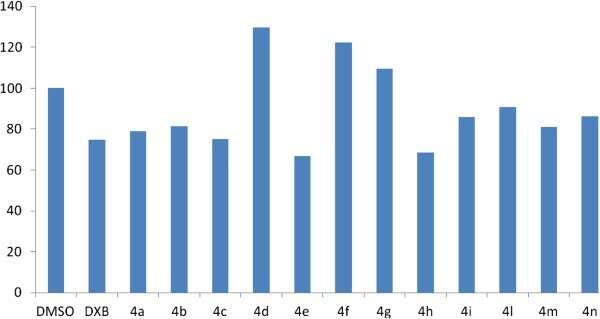 Compounds 4a, 4d, 4i, 4m, and 4n exhibited higher Src kinase inhibitory activity (IC50 =28.1– 34.7 μM in following order 4a>4i,4m>4n>4d) when compared with that of other compounds. Unsubstituted phenyl analog 4a showed an IC50 value of 28.1 μM and was the most potent compound in this series. 2-Chlorophenyl substituted analog 4d was one of the potent compounds in α-naphthol series with an IC50 value of 34.7 μM. Similarly compound 4j with 3-chlorophenyl substitution was a moderately effective compound in β-naphthol series with an IC50 value of 41.7 μM. In addition, 2,3-dichlorophenyl substituted compounds 4f and 4l were among potent inhibitors in both α and β-naphthol series of compounds. However, substitution of 2,6-dichlorophenyl in compound 4g led to loss of inhibitory activity, suggesting that chloro substitution at positions 2 and 6 of phenyl ring is detrimental in Src kinase inhibition. Compounds 4m and 4n with 3-hydroxyphenyl and 4-methoxyphenyl moieties, respectively, were among potent compounds in β-naphthol series. 3-Nitrophenyl substitution resulted in loss of activity in compounds 4e and 4k in both α and β-naphthol series of compounds. Similarly compounds 4b (4-F-Ph) and 4c (3-Br-Ph) did not show any significant inhibitory activity (IC50 > 150) against Src kinase. On the other hand, compounds 4h with pyridine ring substitution and compound 4i with 1-methylnitroimidazole moiety showed good inhibitory activity against Src kinase compared to other phenyl substituted compounds. aThe concentration that inhibited enzyme activity by 50%. The effect of the inhibitors at the concentration of 50 μM on the cell proliferation of breast carcinoma (BT-20) cell line was evaluated (Figure 3). Compounds 4e and 4h inhibited the cell proliferation of breast carcinoma cells (BT-20) by 33% and 31.5% (4h>4e), respectively (Figure 3). Compounds 4e and 4h found to be more potent on BT-20 cell proliferation assay compared to doxorubicin, while compound 4c with 24.8% cell proliferation inhibitory effect against BT-20 cell line was as effective as doxorubicin (25% inhibition of cell growth). Although compound 4h was found to be a moderate Src kinase inhibitor and a potent anti-proliferative agent against BT-20 cell line, there were no significant correlation between Src kinase inhibitory potency of the other compounds with their growth inhibition activity against cancer cells. Compounds 4a, 4d, 4i, 4m, and 4n with good Src kinase inhibitory activity showed less potency in anti-proliferation assay (0-21%). In contrast, compound 4e that showed good anti-proliferative effect against breast carcinoma cells was a weak Src kinase inhibitor (IC50 > 150 μM). It seems that in vitro enzymatic and cell-based assays may not correlate well due to the diversity in solubility and cellular uptake of the compounds. Further studies are required to determine whether these compounds have limited cellular uptakes that lead to their minimal anti-proliferative activities. A number of 2-amino-4-aryl-4H-benzo[h or f]chromene-3-carbonitrile derivatives were prepared and evaluated for Src kinase inhibitory and anticancer activities. In summary, structure-activity relationship studies revealed that the incorporation of less bulkier groups such as unsubstituted phenyl at position of aryl is preferred and well tolerated compared to other groups in generating Src inhibitory activity. The data provide insights for key structural requirements for further optimization of chromene-carbonitrile derivatives as a scaffold and generating more potent and selective Src kinase inhibitors and/or anticancer agents. This research was supported financially by Research Council of Tehran University of Medical Sciences grant number: 10826-33-02-89 and American Cancer Society which supported this study through a grant. The authors declare that there is no conflict of interest related to this publication. AR contributed to the synthesis of some target compounds. AFT contributed to synthesis of the intermediates and some target compounds, and preparation of the manuscript. RK participated in evaluation of the Src Kinase Inhibitory activities. ANS and DM participated in evaluation of the anti-proliferative activities. KP collaborated in management of the pharmacological part, and edition of manuscript. AS contributed in identifying of the structures of target compounds. AF collaborated in design of target compounds. TA participated in designing of target compounds, management of the synthetic and pharmacological parts, and preparation of the manuscript and approval of final article. All authors read and approved the final manuscript.